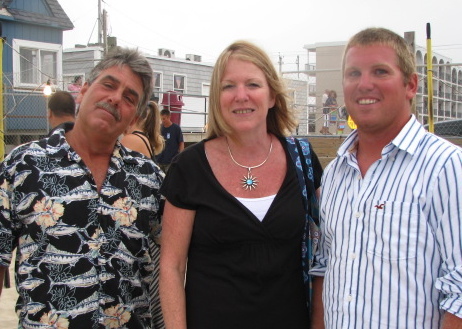 The VanHise family has a long history in Seaside Heights. Shown here is dad Michael, mom Anne and son Steve. VanHise family has history in Seaside Heights: The VanHise name is known in Seaside Heights. Cousins Troy and Steve VanHise are both Seaside Heights Lifeguards. Troy is a teacher at the locally attended Central Regional Middle School, and Steve is the current President of the Lifeguard Association of Seaside Heights. 27 years ago, the VanHise name was also well known as the new marriage name of Anne Carson of the Blimpie Base restaurant, which was at 119 Grant Avenue. After marriage, Anne went on to have three sons with husband Michael, the youngest being Steve. We have no new Talky Blog this week, but we are planning two VERY SPECIAL versions within the next few weeks…The 1970’s Promotional Video of Seaside Heights IN FRENCH and TALKY BLOG #50. August 6th and 7th: Cole Brothers Circus at the Sumner Avenue Bay Parking Lot. Shows 4:30 p.m.and 8 p.m.
August 16th: “HOLIDAY, CELEBRATE!” MADONNA 50TH BIRTHDAY PARTY AND FILM FESTIVAL as part of Free Movies on The Beach in Seaside Heights. All movies start at dusk at the Hiering Avenue beach. Times get progressively earlier as time progresses. 7/28: The 5th Edition: Traditional straight-up Jazz, B-Bop and Contemporary Jazz, featuring local John Lovinfosse. 8/25: Two For The Road, who traditionally begin and end our series and the “Sounds of Summer”. September 5TH, 6TH & 7th: MARDI GRAS WEEKEND! Events at various local establishments on Friday and Saturday. Sunday features Seafood in Seaside as well as the Ocean County Vintage Auto Show. September 12th and 13th: Clownfest weekend. October 5th: Walk to Cure Diabetes 5 a.m. to 3 p.m.
JOIN OUR WEEKLY E-MAIL LIST, AND BE NOTIFIED WHEN THIS SITE UPDATES. SIMPLY DROP AN EMAIL TO popartpete@popartpete.com, AND PUT IN THE TITLE “ADD ME TO YOUR LIST! You are currently browsing the archives for the Week of 7/27-8/2 ’08 category.